I have an encyclopedia of recipes in my head. I’ve been working in the food industry for the past 15 years and I’ve been collecting recipes along the way. Almost every time I get together with the mothers of my kids friends we end up sharing recipes and I immediately start going through my “recipedia” to find the winning recipe. My categories are divided into quick meals, healthy meals, light meals, and fancy meals. There’s also subcategories of types of cuisines-Thai, Japanese, Indian, Italian, and our family favorite- Arab. I’ve been living in Yaffo for 14 years and those fourteen years have filled my recipedia with lots of amazing recipes from the Arab kitchen. Arab food is part of our daily life. A regular day for us very well might include an after-school stop off at the best hummus joint in the country-Abu Hassan. I buy my fruits and vegetables at a stand where all of the crop is seasonal and straight from the farmers themselves, known as “baladi” in Arabic. Only there can I find fresh zaa’tar, vine leaves, and potatoes still covered from the mud they were just buried in. And when it comes to our sweet tooth- the Arab desserts are everywhere. You can find mamoul cookies, knife and malabi- which is our favorite after a day at the beach. For me, living in Yaffo is like being in culinary heaven. One of the Arab recipes that was hidden somewhere in my recipedia is the Arayes. 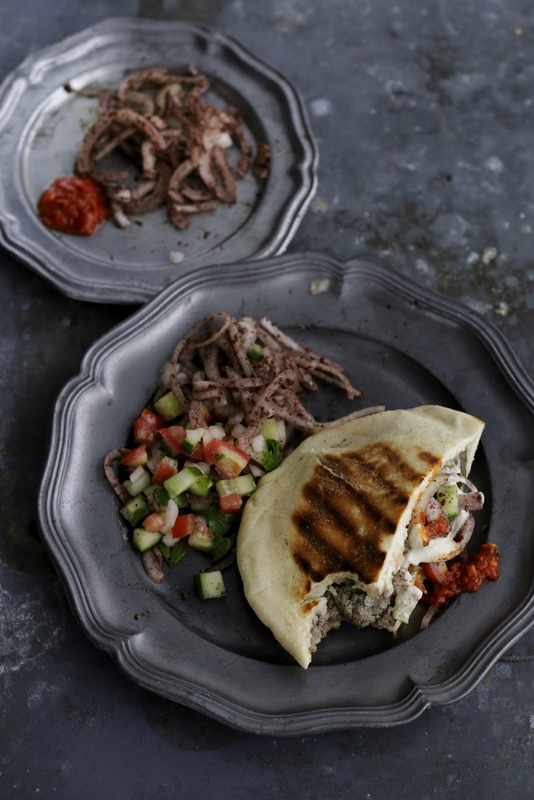 An arayes is a soft pita filled with kebab meat (uncooked) and placed on a grill and cooked to perfection. There is no real recipe for this one, but there are some guidelines to follow. Since this is only a two ingredient thing- both must be of really good quality. 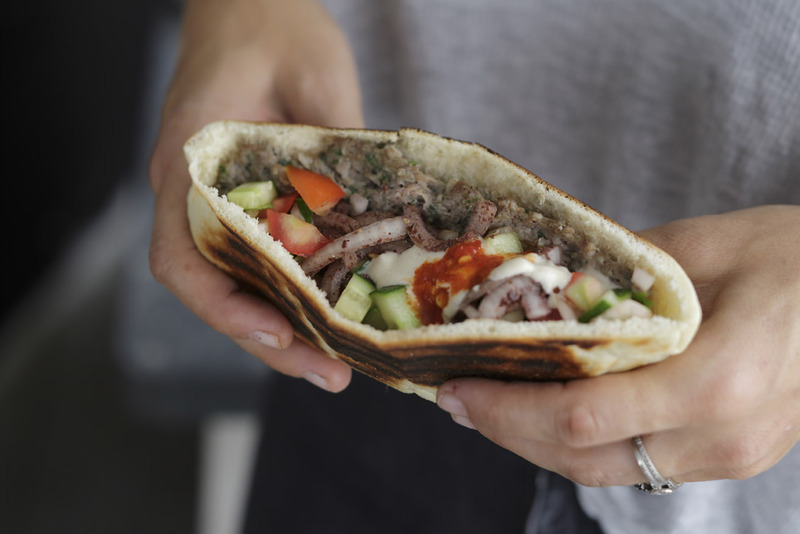 The pita needs to be the fresh, doughy type and the kebab needs to be good quality meat (not frozen from the supermarket), seasoned to perfection. Slice the pita into two and stuff the half with one or one and half ready made kebabs. The layer of meat shouldn’t be too thick or else it won’t cook all the way through. Brush the outer layer of the pitas with olive oil and place in a panini maker or on a grill pan, or a real outdoor grill. 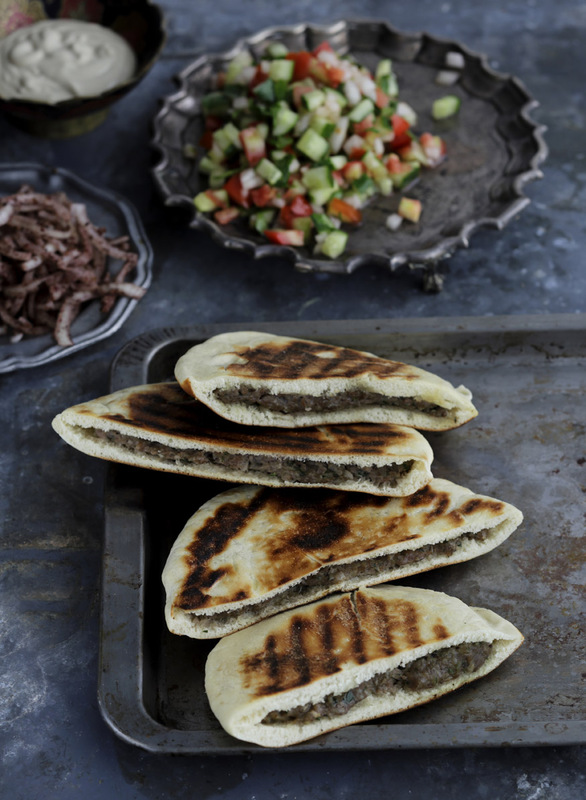 Cook for 507 minutes on each side, until the meat is cooked through and the pita is browned and crispy. Serve with a chopped vegetable salad (tomatoes, cucumbers and onions) and onions topped with sumac, and tahini.